The Most Durable Flooring You Need In Your House! I’m obsessed with LVT (Luxury Vinyl Tile) flooring - which is exactly why I chose it for my own office. I know, you hear the word ‘vinyl’ and you think of the old, thin, sheet vinyl that’s peeling up in your grandmothers bathroom, but this is NOT the same stuff! The core of the material can vary depending on the manufacturer, but they’re generally made up of recycled wood and bamboo dust, limestone and PVC, which make the material both stable and flexible. Did I also mention that it’s waterproof? Rolling Wheels? Bring it On! 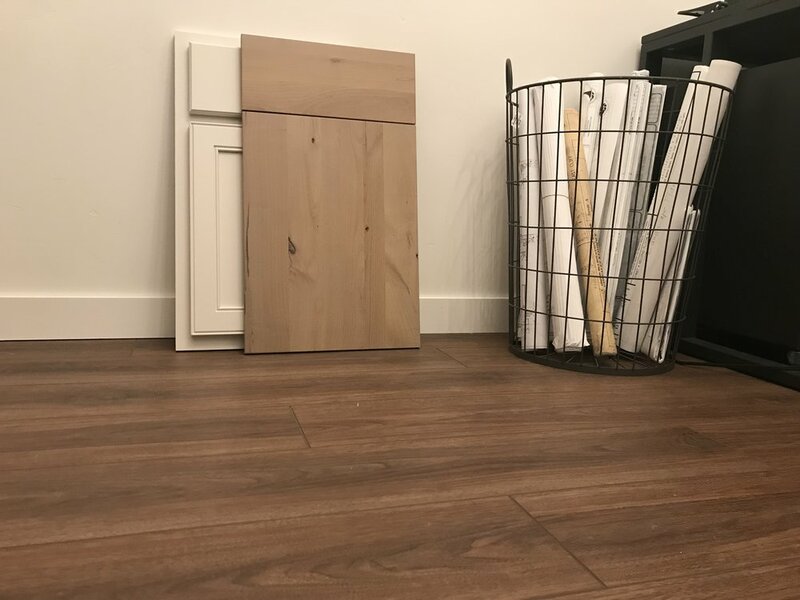 The material is relatively inexpensive when compared to hardwood, engineered hardwood, and tile, and the installation is simple (yes, my husband and I installed it ourselves in my office!) - it’s a floating floor, which means it’s not glued down or nailed down to the sub-floor. The planks (or tiles) slide and click together and they can be cut with a skilsaw. The planks are cork backed which minimize noise (great for apartments, condos or second floors), keep a nice soft feeling under bare feet, and makes the material resistant to mold and mildew. What’s even better? Kids toys, pet toenails, rolling chairs (anything on wheels), and anything you might bring in on the bottom of your shoe are no match for the super durable finish - you don’t have to worry about scratching with every day wear and tear. If a piece were ever to be damaged, it can be replaced fairly easily. Need to see it in person? Come visit the Studio (or one of your local flooring stores)! Want to learn more or have questions? Post a comment below!